It's time to WROOOM! Preparations are made for the unveiling of the Desmosedici GP13, scheduled for Jan. 15th evening in a mountaintop chalet at Madonna di Campiglio. In the meantime, the bikes were transported up the mountain, clearly under wraps, behind a snowcat, arousing the curiosity of the skiers on the slopes. 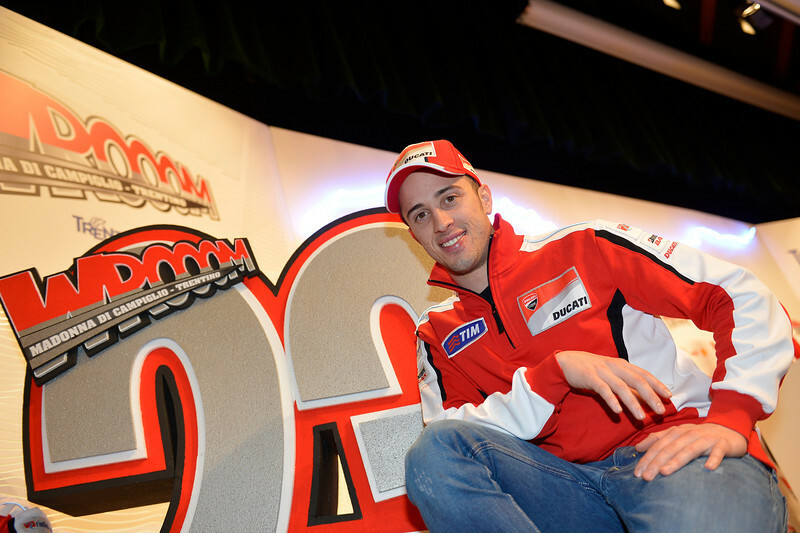 Tues am, the two Ducati Team riders held the first press conference of the event that symbolically marks the start of the international motorsports season. Wrooom 2013 continued on Wednesday with press conferences for Bernhard Gobmeier, the new General Manager of Ducati Corse, and Stefano Domenicali (Ferrari Team Principal). Thursday, it was be the turn of the Ferrari drivers, whereas Friday’s grand finale features a spectacular exhibition challenge, with the MotoGP riders and Formula 1 drivers facing off in karts on the town’s frozen lake.